In celebration of Women’s History month, this is the third post in a series by guest blogger Kim Reynolds (Curator of Manuscripts) focusing on BPL's special collections featuring notable 19th century American women. Poet Emily Dickinson (1830-1886) was born in Amherst, Massachusetts in the family home known as Homestead. From a prominent family, Dickinson attended Amherst Academy for seven years. There, she studied English and classical literature, Latin, history, and science. At the age of sixteen, Dickinson enrolled at Mount Holyoke Female Seminary but stayed for only ten months before returning home. For the next forty years, she would lead an increasingly private life, rarely leaving Homestead and her familiar surroundings. 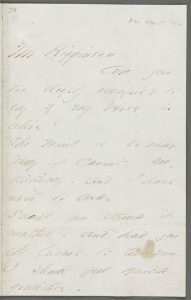 MS.Am.1093 (1) In her famous April 1862 letter to Higginson, Dickinson asks, "Are you too deeply occupied to say if my Verse is alive? The Mind is so near itself—it cannot see, distinctly—and I have none to ask." Dickinson greatly admired the work of William Shakespeare, Elizabeth Barrett Browning and Ralph Waldo Emerson. However, it was her willingness to break with established poetic conventions that made her one of the greatest American poets. While she wrote 1,775 known poems, only a handful were published anonymously during her lifetime. In 1862 she responded to Thomas Wentworth Higginson's article in The Atlantic that offered promising writers advice on how to write for magazines. In her letter, she asked Higginson—a well-known author and activist—if he thought that her poetry was good enough to publish. Higginson expressed doubts about her chances of success because of her unconventional form and style. Undeterred, Dickinson continued to write. She sent poems and other small enclosures—including newspaper clippings and pressed flowers—to both him and to her friends. Dickinson died on May 15, 1886. Her poems—stitched together into hand-sewn books—were found by her sister Lavinia in a locked chest. Dickinson’s first book, entitled Poems, was published posthumously in 1890 by Thomas Wentworth Higginson and Mabel Loomis Todd. 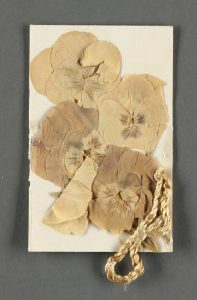 Pressed flowers enclosed in a 1862 letter to Higginson. 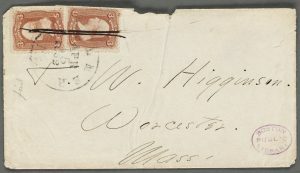 The Emily Dickinson Collection consists of 70 letters and 43 poems sent by Emily Dickinson to Thomas Wentworth Higginson. The letters, many of which Dickinson signed “Your Scholar,” provide insight into their relationship and Dickinson’s personal life. Also included are letters written between Thomas Wentworth Higginson and Mabel Loomis Todd regarding the publication of Dickinson’s poems after her death in 1886. Our complete Dickinson manuscript collection has been digitized and can be browsed and downloaded through Digital Commonwealth. A finding aid for the collection is also available. 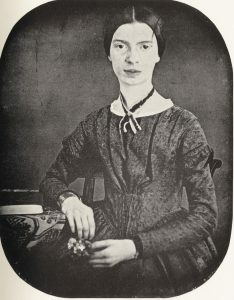 Suggestions for further reading on Emily Dickinson. As the Civil War raged, an unlikely friendship was born between poet Emily Dickinson and Thomas Wentworth Higginson, a literary figure who ran guns to Kansas and commanded the first Union regiment of black soldiers. Their intense correspondence continued for the next quarter century. A selected collection of letters Emily Dickinson wrote to her friends and family between 1845 and 1886. The Complete Poems of Emily Dickinson brings together in a single volume all 1,775 poems that Dickinson wrote; one of the only comprehensive and reliably authoritative trade editions of the poet's work. Cynthia Nixon delivers a triumphant performance as Emily Dickinson, personifying the biting wit and staunch independence of the great American poet, who would not be recognized until after her death.An in-depth exploration of the life and work of the great American poet Emily Dickinson, narrated by Cynthia Nixon. Bringing to light new theories about Dickinson's personal relationships and most revered work, this feature documentary rewrites the widely accepted narrative of the poet as a strange recluse in white, and breathes new life into the Dickinson legacy over 130 years after her death. An in-depth exploration of the life and work of the great American poet Emily Dickinson, narrated by Cynthia Nixon. Bringing to light new theories about Dickinson's personal relationships and most revered work, this feature documentary rewrites the widely accepted narrative of the poet as a strange recluse in white, and breathes new life into the Dickinson legacy over 130 years after her death.